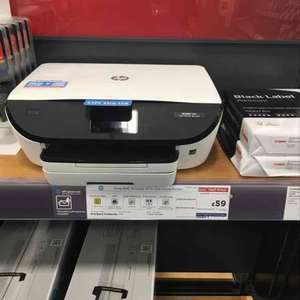 This printer is available in currys/Pc world store or on there website. It's great deal . You will save £96 worth of ink. Print pics or anything for free for a year. I love instant ink, we use it in our shop, it saves a fortune, wish we'd switched to it sooner. When do you have start the Instant ink? Can I wait while the last Hp printer deal 5 month ink has run its course? This one has much higher DPI . It states up to 1 year instant ink rather than the actual amount of months listed on other printers. So what does the up to mean? It states up to 1 year instant ink rather than the actual amount of … It states up to 1 year instant ink rather than the actual amount of months listed on other printers. So what does the up to mean? I've just seen another deal thread on here for the same printer, it says you get 4 month's free and a £16 credit voucher that you can use to get 8 month's free of the £1.99 per month plan. When do you have start the Instant ink?Can I wait while the last Hp … When do you have start the Instant ink?Can I wait while the last Hp printer deal 5 month ink has run its course?This one has much higher DPI . anyone know the difference between this and the Envy 5544 also same price at Currys? Is it just the colour? I've just seen another deal thread on here for the same printer, it says … I've just seen another deal thread on here for the same printer, it says you get 4 month's free and a £16 credit voucher that you can use to get 8 month's free of the £1.99 per month plan. It's the same printer although looking at the whole thread it's still not clear. The link says "5541" - they are the same printer, the changing last digit is just a variation in the style, this white vs the black. No it means you get 4 months for free. There is an additional code in the box for £16 credit, you get to use the credit as you wish. You can choose the 50, 150 or 300 pages a month package. The additional time you get for free depends on which package you choose from 2 to 8 months. You can run both deals at the same time. The deal is tied to the individual printer not your account. I had the cheaper Currys Envy deal and then swapped it for this one. This printer prints very clear photos without any banding. You can run both deals at the same time. The deal is tied to the … You can run both deals at the same time. The deal is tied to the individual printer not your account. I had the cheaper Currys Envy deal and then swapped it for this one. This printer prints very clear photos without any banding. How do I use a referral link that I already have, for the free month in conjunction with setting up my new printer to get the free 4 months included with my new printer? Got one of these Friday. Had a few issues with cartridge failure messages on the black. Finally got everything going until at page 9 the Yellow ran out. No UK customer support services at the weekend either so probably won't get it going again until at least mid week. So much for "your never run out of ink before receiving new cartridges" !! !